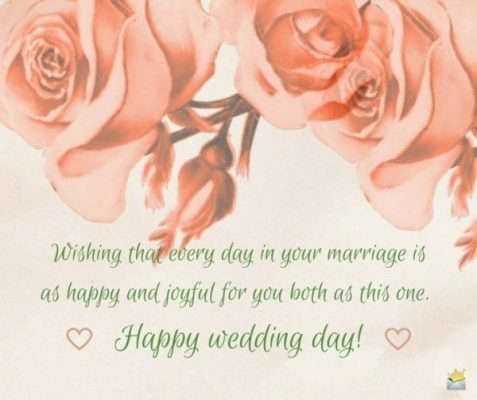 Are you looking for some inspiration to write a warm and meaningful personal message in a wedding card for the happy couple? Well, you’ve come to the right place. Below you’ll find a huge range of wedding wishes and messages for cards. 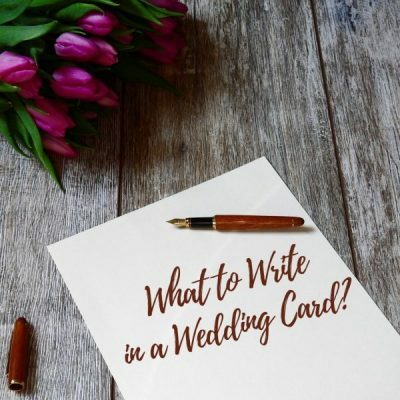 In addition, this “What to Write in a Wedding Card” guide contains some useful writing tips that can help you congratulate a newly married couple in the most respectful way. You know how hard it can be to choose a nice wedding card for a newly married couple. They come in lots of various formats. You can find a wide variety of pretty standard greeting cards at a cool stationary shop or even try to make a special wedding card at home. However, don’t think that choosing a beautiful wedding card is the most difficult part of wedding planning for you. Oh, no! The most difficult part is to realize what to write in a selected wedding card. The perfect marriage message should be heartfelt, sentimental and totally tailored to the newlyweds. Of course, the wedding wish should include congratulations (the term “congratulations”) because this expression is considered a nice way to warm up your marriage greeting. 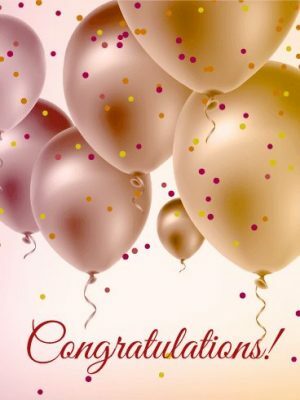 In the case when you’ve picked out the card with a printed term “congratulations”, you can follow it with an ellipsis […] and add to the “congratulations” wish. After “congratulations”, you should write a personalized wedding wish for the newlyweds on the next few lines of the cards. This is the most crucial part of the message and you have to be creative and unique. One of the best ways to find inspiration for this part is to read our wedding card examples given below and create something special for the happy couple. You may also save a line in your greeting in order to thank the couple. But don’t forget that if you have complicated feelings about the wedding or when you simply don’t know the couple very well, a thank-you for being a part of the wedding may sound a bit crass. You should finish your greeting card with a warm closing. So, before you sign your name, you can leave the newlyweds with some sweet words. Remember, if you can’t come to the wedding, you don’t have to complete your personal wish with an apology. 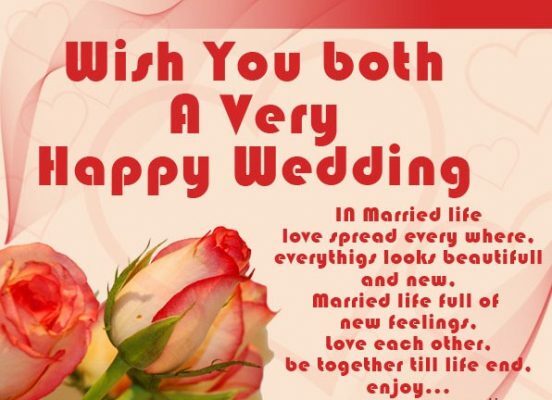 Just send your wedding card and let the newlyweds know that you’re thinking about their happiness. 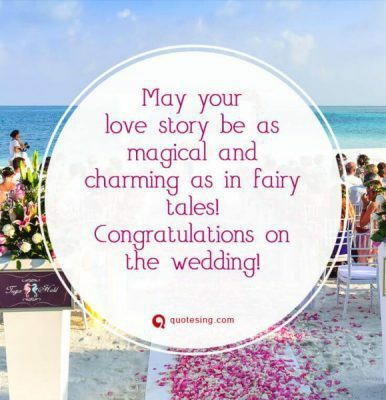 Below are some of the sweetest wedding congratulations wishes that can inspire you and help you create a sincere wedding message for a newly married couple. Congrats, [names]! It’s so great to see two awesome people like you getting married. Love and best wishes always! Best wishes for a fun and happy future together. It’s official! You’re stuck with one another! Congratulations on your wedding, and all the best for a future full of fun and adventures. Hope you’ll always find yourselves as much in love as you are today. Best wishes to both of you on your special day! May the future be brightly filled with all the blessings and joys of life. You two deserve it! Your wedding is such a wonderful day for the two of you and for our family. The two of you are meant for each other and this day only cinches it. My very best wishes to both of you for a wonderful life together. When you two are knotted as one, both families and friends share in the oneness of their marital union; may this marriage be a bridge to usher happiness, peace and prosperity. Wishing you love, joy, and happiness on your wedding day as you begin your new lives together. Blessed is the man who finds a wife. May the joy of your new home be filled with laughter, smiles, kisses, hugs, respect understanding and faithfulness. Happy wedlock. May today be the beginning of a long and happy life together. I just know life has even more wonderful things in store than the happiness you share today. May every day be beautiful and happy for you as a couple. 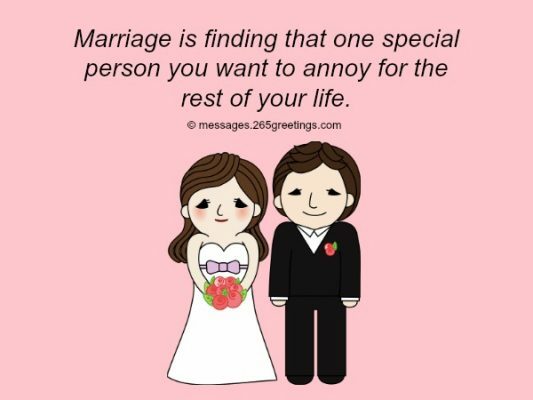 Marriage lets you annoy one special person for the rest of your life. I am glad you found your special person. Our marriage advice: love, honour and…scrub the toilet. Remember, marriage is a workshop… where the husband works and the wife shops. Thanks for the free food and drinks today as we watched you get married. Congrats! What do late nights, parties and hanging out with friends have in common? You won’t be able to do any of them from now on! Happy wedding day. A new love is like a budding flower. Your love has matured into a rich red rose, and we are honoured to celebrate that love with you today. May it always remain unwavering; congratulations on your wedding. Wishing you all the best with the ceremony and a long and happy future together. May the honeymoon last forever! You have shared so much love and laughter over your years together, and I know there will be many more joyful moments to come. Congratulations on making this step together, and may your love see you through all life’s ups and downs. Marriage is not just an auspicious bond. It is a journey that lasts till eternity. Right at the beginning of the journey, here’s wishing that both of you have a memorable and joyful ride. Andrew Guerra is an editor of https://sweetytextmessages.com/ He likes to share his thoughts with the people around. His writing on motivation and love has appeared to make our life better. Andrew believes in fairness and human wisdom.